Foliate Frieze Centered by Cartouche with Arms of the Mastai Ferretti Family, on Scrolled Legs of this antique console table Joined by Wavy "X" Stretcher on a Later Verde Antico Marble Top. Provenance: Commissioned for The Mastai-Ferretti Family, Sennigalia, Anacona, Italy. A Nobility Family from Sennigallia in the Province of Anacona, The Mastai Ferretti Family is remembered most for Giovanni Maria (1792-1878), who as Pope Pius IX, was the longest-serving Pope in history. 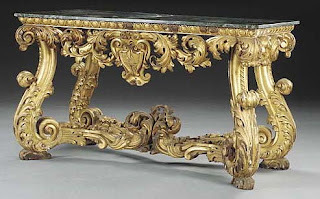 I am very much impressed by your blog, you can find more console tables. that suites your budget.